Excitement and feeling of my Kiwi life starts from some very well known NZ travel activities. 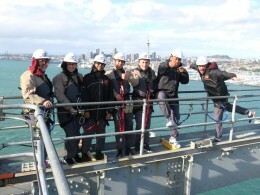 Auckland Bridge Bungy: My first bungy experience in my life in Auckland!!! Yahooo, I made it. After 3 times of failing to jump, finally I did it! Undoubtedly, unique experience in my life! My excitement was absolutely blasted when I touched the Ocean! Yes, I have touched the Ocean with my Auckland Bridge Bungy. Ocean touched bungy is completely unique and it’s only possible from the Auckland Bridge Bungy. 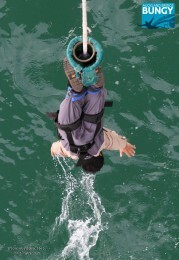 Dare to fear and do NOT leave NZ with out gaining fully unique experience of Ocean touched Auckland Bridge Bungy!!! Fun Fun and Adventure….! Sky Jump: What could be the greater fun and excitement than having the highest Jump in NZ from the lovely landmark of Sky Tower! 192 meter Sky Jump from Sky Tower with 360 degree panoramic view of Auckland city with Go Pro never disappoints your heart. Evergreen memories in the core of my heart…loved this great experience! Thanks Surf N Snow to arrange everything.